I have my various tricks for insomnia, such as parking myself in bed and trying to absorb myself in a dream I half-remember, in hope that it will send me drifting into sleep, or reading, or discovering new and welcome additions to the blogosphere, or even attempting a recipe that seemed too fiddly for four pm, but just right as a storm whips up outside the windows and I am snug indoors, kneading at the floured kitchen table and watching the trees dimly sway in the courtyard. I'd intended to make the Cheese Board's Chocolate Things for Christmas breakfast, but then was put off by the two-hour rising time needed on the day even if one opted for a first overnight rising. With the cream and buttermilk still waiting patiently in the refrigerator last night, I thought it was time to put them to use. I was a bit unsure of the wettish dough, though I enjoyed manipulating it in the rhythm of kneading, and though an overnight rising was given as an option in the recipe, my dough moved not a whit between 5.30 am when I put the bowl in the fridge and 1 pm, when I brought it out. The results were palatable enough, but it only seems fair to wait til I have a recipe I'm entirely happy with before posting it. I wonder if I'll ever tire of examining the various odd beverages that line the shelves in the back room of the BioCompany. (Indeed, I wonder if those who read this will ever tire of my indefatigable enthusiasm for the BioCompany?) Spotting this bottle of Brottrunk (literally, 'bread drink'), I speculated it might be something along the lines of kwas, that mildly sweet yeasty beverage I occasionally order when visiting Voland. It turned out to be something quite different. Made from whole wheat bread, sourdough, and water from the Herbach spring, Brottrunk turned out to be mildly sour, smelling slightly of very weak white wine or, perhaps, sauerkraut juice. I'm not sure I'll buy it again, but I don't regret having bought it once, if for nothing else than the rather fey advertising copy on the back of the bottle ("is healthy" and "good for your skin, digestion and blood" are a few of the bullet points). 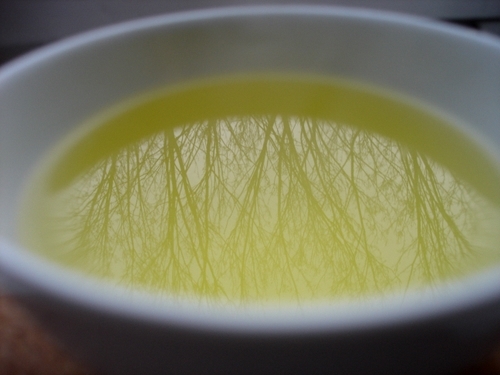 I've always liked the idea of tisanes and herbal infusions, associating them as I do with daydreaming while looking out the window,but up till now have not really found herbs or combinations that I genuinely enjoyed drinking. Peppermint always seemed a bit too aggressive and simple for me, chamomille - inexplicably - has always made me feel nauseated, and the fruity blends Germans are so fond of taste artifically cheerful, even when the ingredients are all natural. As a stalwart fan of elderflower's perfumed intensity, I found myself pausing over Sonnentor's brown-paper packet of dried elderflower leaves (Holunderblüten) while browsing at the BioCompany. After eyeing it over a few visits I was unable to resist, reasoning it was just the thing for my lingering cold, and brought some home with me. It might, finally, be just the tea I've been searching for. Already I love the ceremony of crushing the little buds and stalks with my fingers and am taken by its mild, honeyed fragrance. 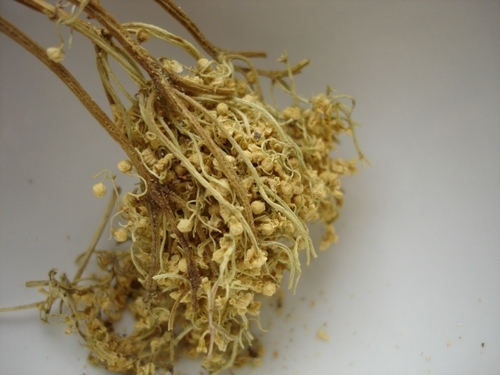 And elderflower tea is touted as a cure for coughs, colds and the flu. Find it at the BioCompany if you're in Berlin or order from Sonnentor's website (only in German): a 50-g bag is 2.80 EUR; in the States, In Pursuit of Tea carries dried elderflowers as well. Promptly following the official start of winter, the first snow fell in Berlin today, and the sudden cold made me especially glad Sue and I had arranged to go to Weinstein. With its simple dark-wood furniture, snug interior, and bottle-lined or barrel-studded walls, Weinstein is the epitome of coziness; above, you can even see the traditional tiled oven in one corner, now purely decorative. We shared a plate of French raw-milk cheeses, accompanied with crusty white and multigrain dark breads, and sampled a few of their red wines (a simple Languedoc Cabernet Sauvignon for me followed by a deep cherry Spätburgunder), and watched the place fill up and talked. Snacking and sampling has always been my favourite approach to Weinstein; though they have highly regarded three- and four-course menus matched with wines for around 36 to 44 EUR, I've always found their cooking competent but lacking the dimension that makes you close your eyes in pleasure. But their snacks - garlicky breads, the cheese plate, or a plate of local sausages, meats and cheeses from the Brandenburg region - are just the thing to nibble at while contemplating what to try next. After the many-layered efforts of our main course, it seemed sensible to keep things simple for our Christmas dessert. My cheesecake recipe comes from my mother, who got it from a friend in Berkeley about 35 years ago; the yellowed sheet of paper lives in our Joy of Cooking now. I love its texture, at once airy and dense, and its subtle sweetness and mild citrus note. The sour cream topping provides just the right contrast, and I enjoy the almost-imperceptible grit of the vanilla bean seeds (my own touch). Add butter and vanilla to crushed crackers. Line 10-inch/25-cm springform pan. Chill in fridge. Beat cheese till soft and fluffy, about 3 minutes. Add sugar and salt and beat thoroughly, again about 3 minutes. Add lemon juice and the eggs, one at a time, beating for about 45 seconds after each egg. Pour the cheese mixture into pan and bake at 325 F/160 C/gas mark 3 (Germany) for 45 minutes (rotate once after fifteen minutes). Cool in fridge. Mix the sour cream, sugar, and vanilla seeds. Pour on top of cake. Bake at 325 F/160 C/gas mark 3 (Germany)for 10 minutes. The first question that strikes two vegetarians (of greater - David - or lesser - me - strictness) when preparing for their first Christmas meal together is what the main course will be. The German goose, the British turkey or the American ham all have a ceremonial heft one doesn't want to forsake, yet substantial dishes such as a lasagne are far too everyday. As for many cooks making vegetarian meals, Deborah Madison is something of a guru for me: She doesn't conflate vegetarian with ascetic and has a range of dishes that belong to a realm I associate with classic French cooking (thyme, bechamel, shallots), love, and normally miss in meatless cooking, with its usual drawing on Mediterranean or Asian cuisines for inspiration. Take the filo dough out of the fridge or freezer before you begin. Heat the oven to 350 F (180 C, gas mark 4 in Germany) and roast the walnuts in a foil-lined baking tray for about 10 minutes or until fragrant. Chop finely. Preheat the oven to 400 F (200 C, gas mark 5 in Germany). Make the layers: Brush the bottom and sides of a 13-by-9-by-2-inch pan (or thereabouts) with butter. Lay down a sheet of filo dough and brush it with butter, and sprinkle with some walnuts, and continue until you've used about one-third of the dough and the walnuts. Spread on half the filling, then continue with the filo and walnuts until you've used the next third, spread on the rest of the filling, and continue again with the filo and walnuts until finished. With a sharp knife, cut the pastry into 3 inch squares (or whatever size you'd like), making sure to cut through to the bottom. Bake for about 45 minutes or until golden brown, rotating the pan once after twenty minutes. I think it's a dish best served warm, but also fine at room temperature for a buffet. Our first Christmas together as a freshly married couple was, self-consciously or not, a time of establishing rituals. Will we really have bliny with mushroom caviar every Christmas Eve? Well, the raisin scones on Christmas morning are certainly here to stay. Flattening in the oven to resemble cookies more than scones, with delightfully crisp edges and a tender crumb, this recipe from a wedding-present cookbook (The Cheese Board) was a winner, and easy-peasy to whip up between opening presents. Here too I had a bit of yield confusion, ending up with 24 rather than the promised 10 to 12, but neither I nor David nor his office mates were complaining. Still, if baking for two I'd halve or even quarter the recipe next time, as they were certainly at their finest on the morning of their making. Preheat the oven to 375 F (190 C, gas mark 4 in Germany). In a large bowl, mix the flour, baking soda, baking powder, salt and sugar. Add the butter and cut in with two butter knives until the mixture resembles coarse meal. Add the raisins, then mix in the cream and buttermilk. Shape the dough into two-inch balls and place two inches apart on a lined baking tray (I used a silicon mat). Sprinkle on the topping and bake for 25 minutes or until golden brown. 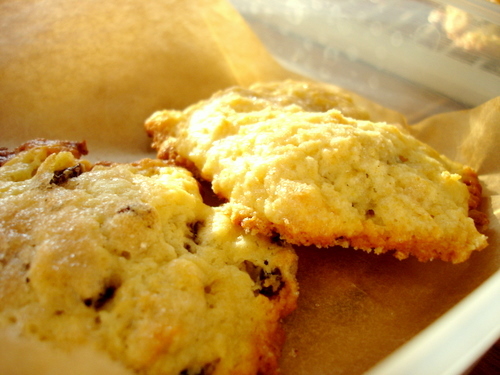 Leave the scones on the tray for a minute or two, then transfer them to a rack to cool.